Surprise! 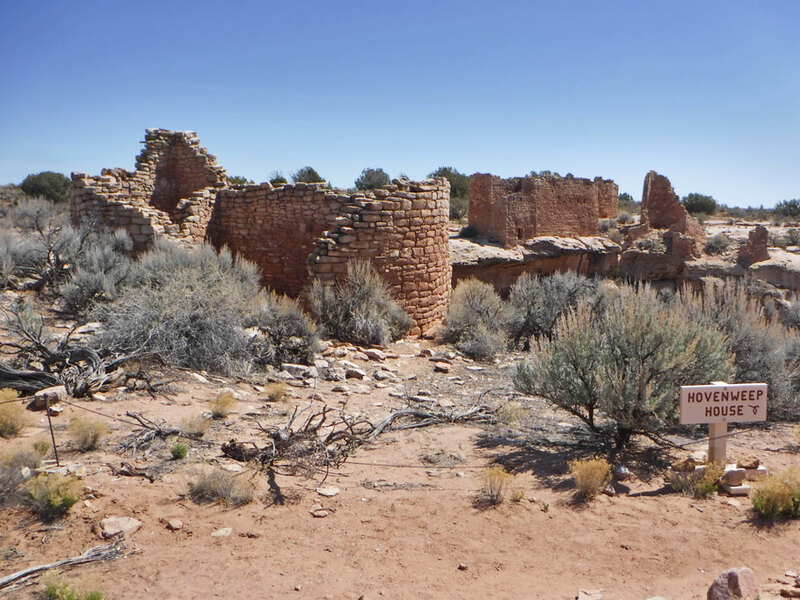 Greg and Duwan have another post about rocks in the desert. But look a little closer. These are ruins left by 13th century pueblo peoples. 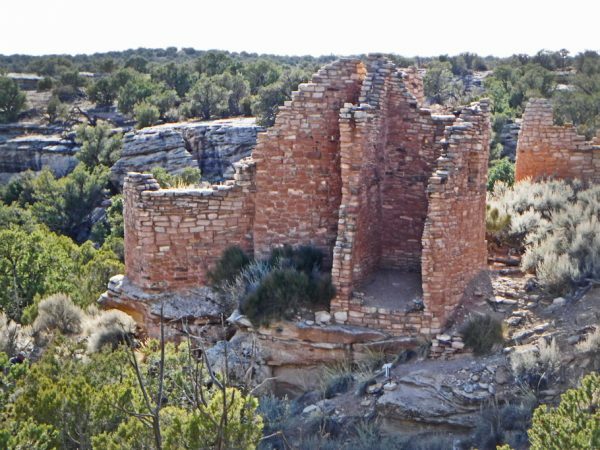 We are at the head of Little Ruin trail at the Hovenweep National Monument’s visitor center. 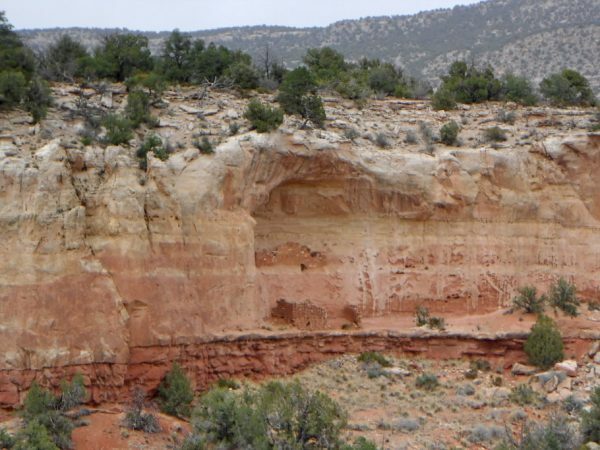 Let’s walk around this canyon’s rim and take a look. April 18 – April 19, 2018. Duwan calls it “hundering”. It’s a mixture of hunting and wandering, often triggered by a chance conversation with a fellow traveler. Back at Gold Butte I was practicing accordion songs. I thought our only neighbor was out 4-wheeling, and was surprised when he came over to listen. As we chatted, he said he liked Hovenweep. Now THAT’S a word guaranteed to inspire a good hunder. The hunder is self-perpetuating. 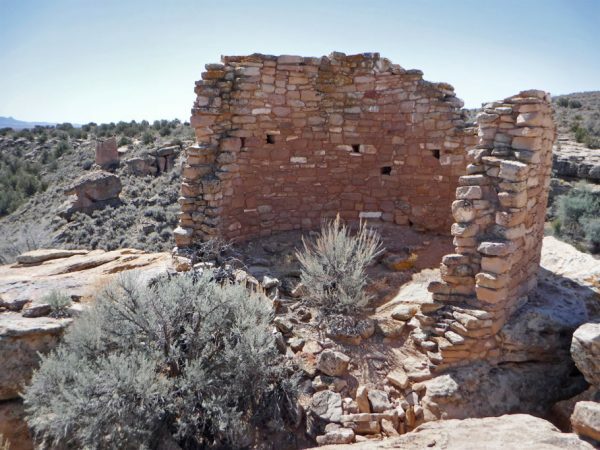 Ours started at the Hovenweep visitor center in Utah. Here we learned about some of the pueblos in the area. The park actually extends into Colorado. So we did, too. 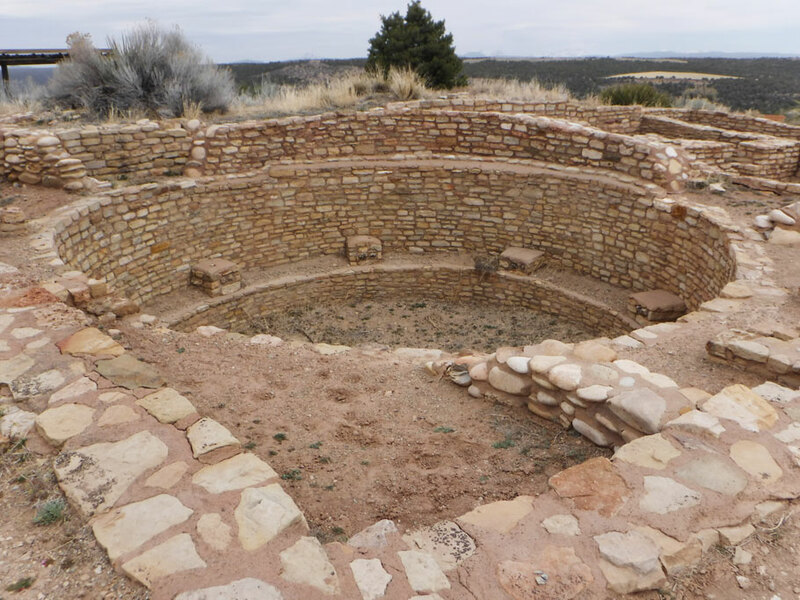 After Hovenweep, we went to Lowry, then to the visitor center at Canyon of the Ancients National Monument. 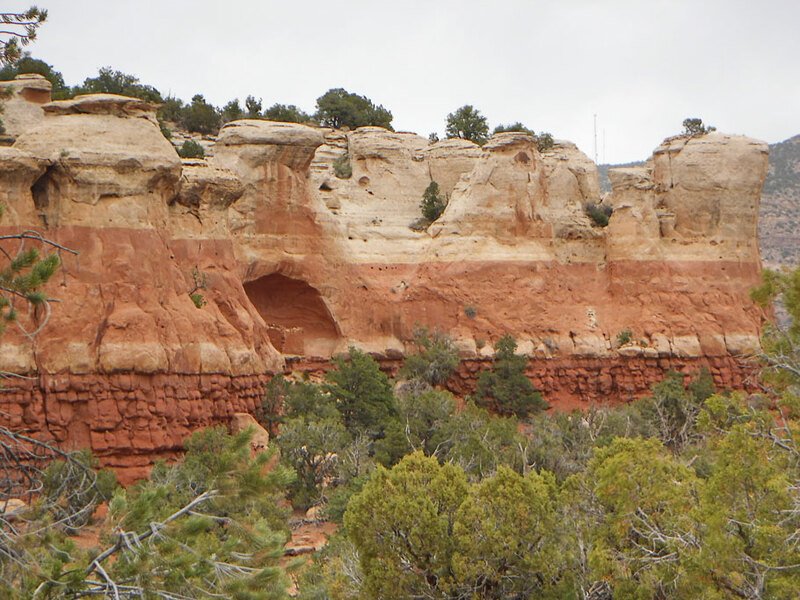 Then on to Sand Canyon. Right now, this very minute, we are still in Florida taking care of some boat stuff at Indiantown Marina. It is hot and muggy here and although we have enjoyed seeing friends we are looking forward to being back in Cabbagetown by Friday just in time for the big games on Saturday … the first ever Cabbagetown Olympics! 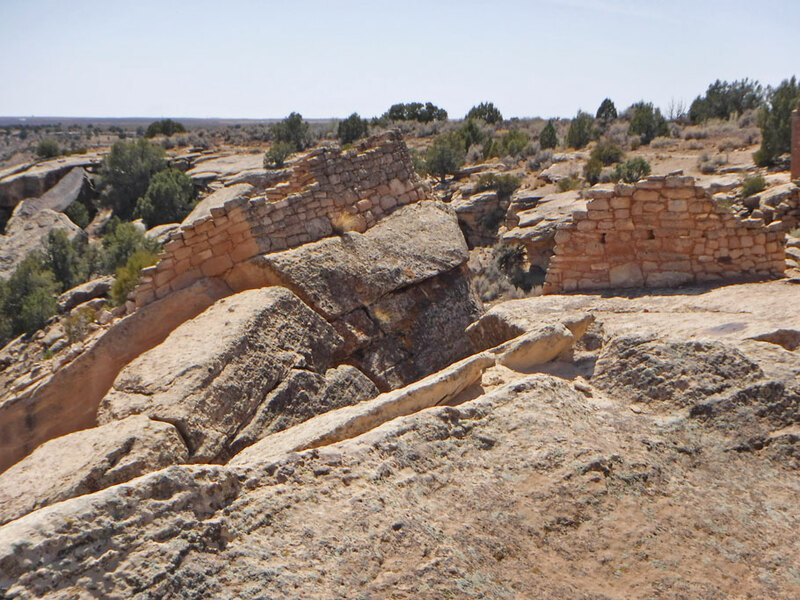 This region of the four corners contains many ruins which post-date the Chaco Great House era. 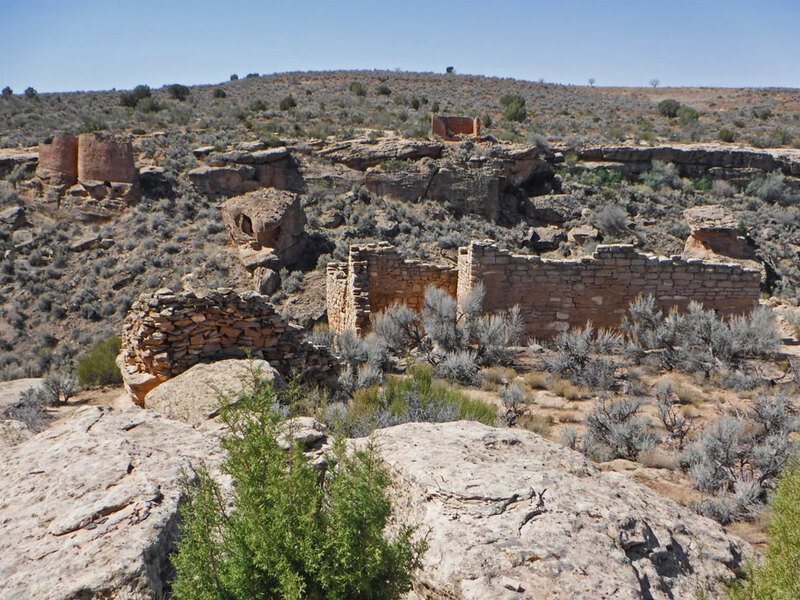 Groups of villagers (100-150 people) built near springs in canyons around here. 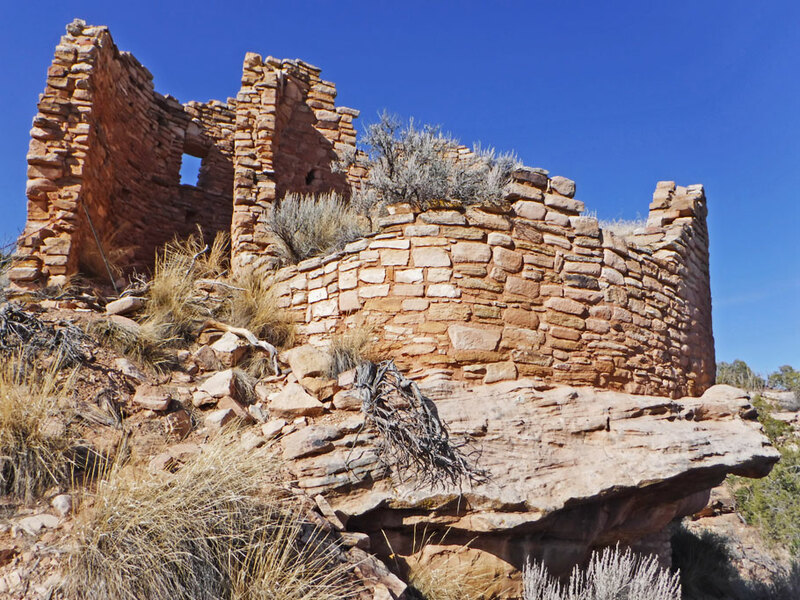 These smaller, less organized groups often took daring and unique approaches. 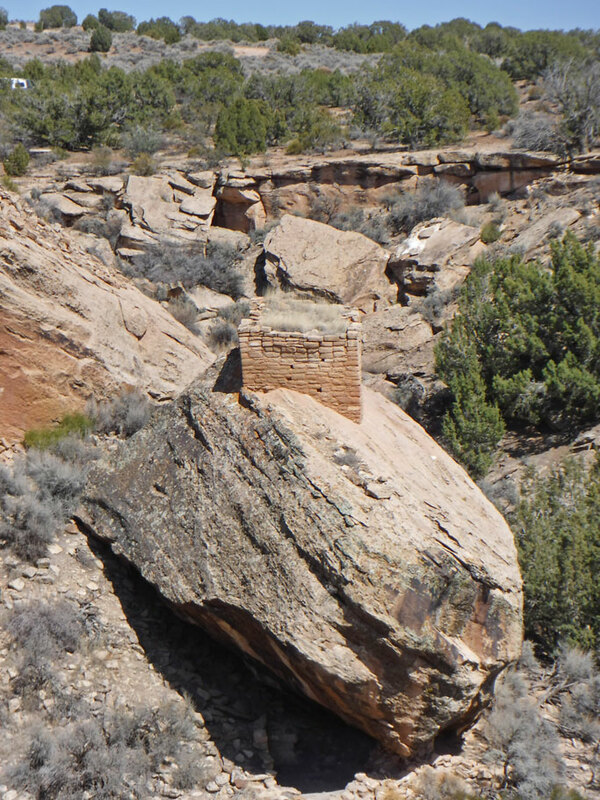 The structure here was built inside an eroded out boulder. 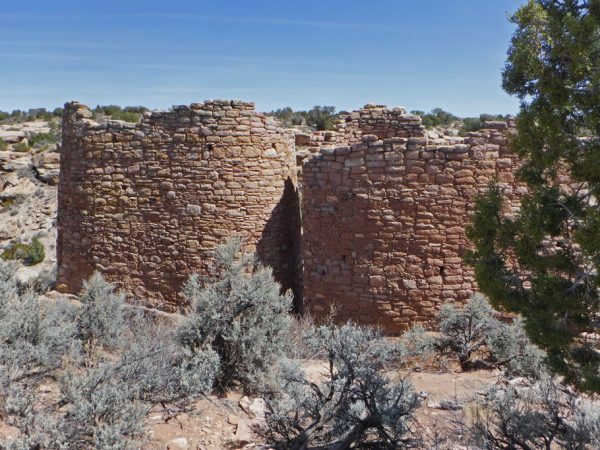 Like many buildings, the two-story Hovenweep Castle was built close to canyon’s edge. Not really a castle, it housed farmers who grew corn, squash, and beans. 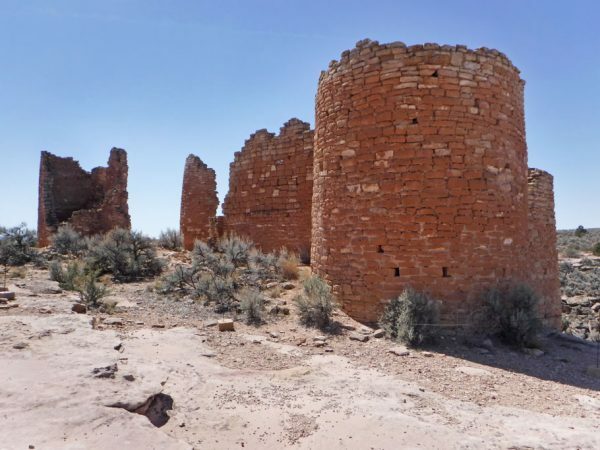 “Tuwalanki” is the Hopi word for watchtower. These towers at the canyon’s edge were used to watch the surrounding land and the night skies. Here is Hovenweep House, with the “castle” in the distance. 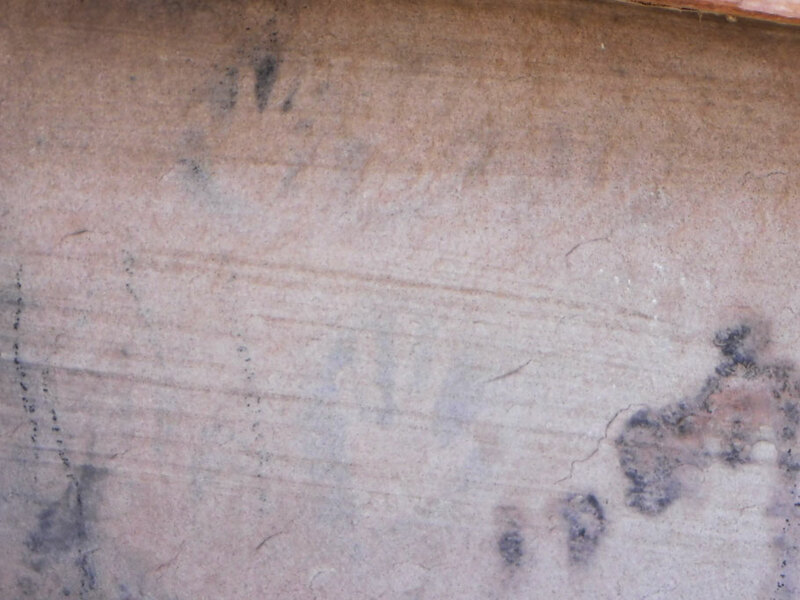 The pecked surfaces and “spall” chinks between the bricks indicate that the house’s walls were probably plastered. You can’t see it, but there was a check dam between the house and castle to catch and hold rain water. Need a tower? Well, you have a stable, relatively flat planet to put one on, or you can build on a boulder at the bottom of the canyon. And give it a little twist, too. 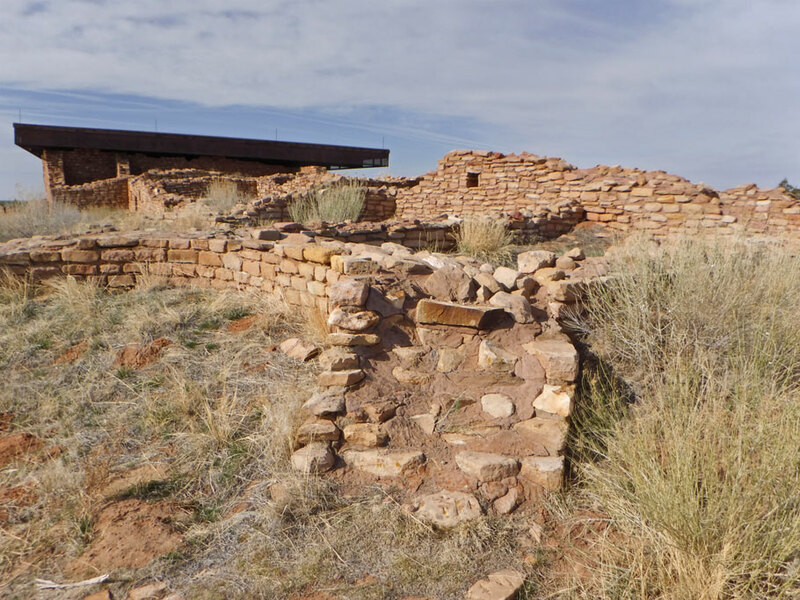 The structures in these small communities show a playfullness we didn’t see at Chaco. Square tower with house in the background. 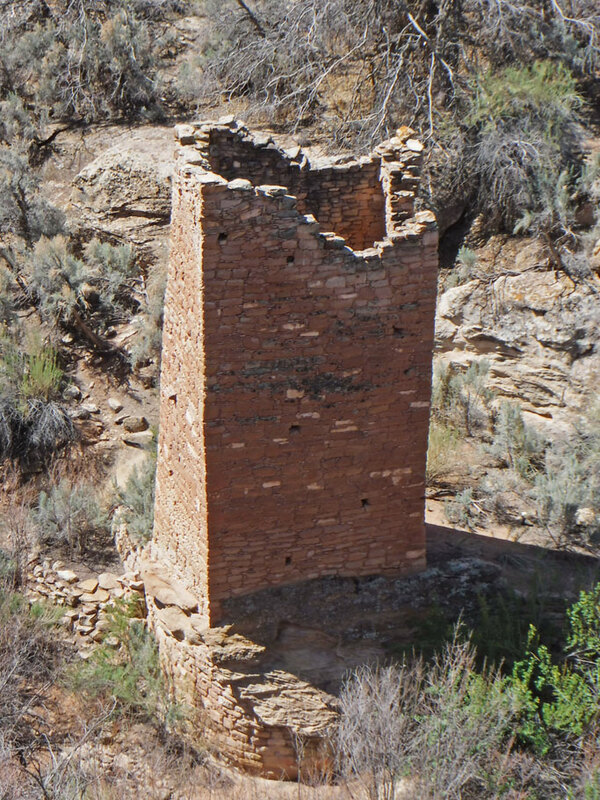 Thick-walled structure at Tower Point overlooking the canyon. 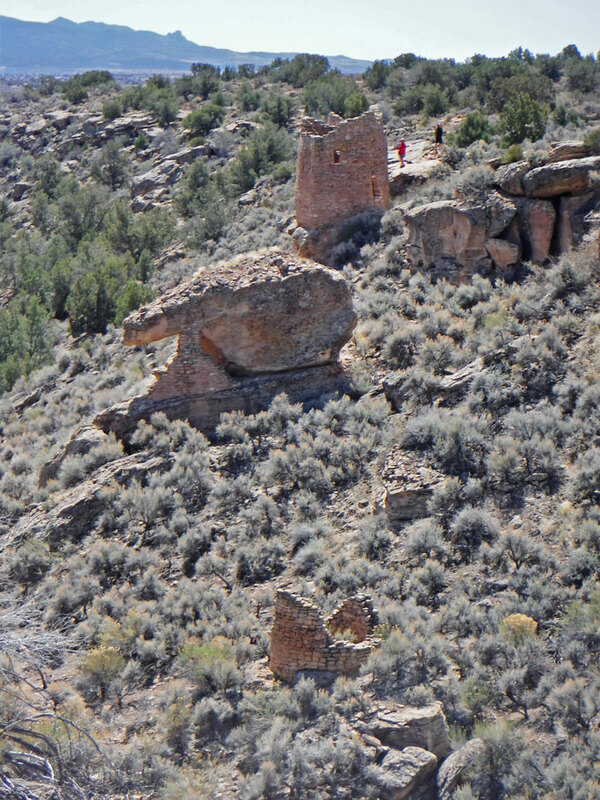 Here is another angle of the eroded rock structure with one of the Twin Towers in the background. 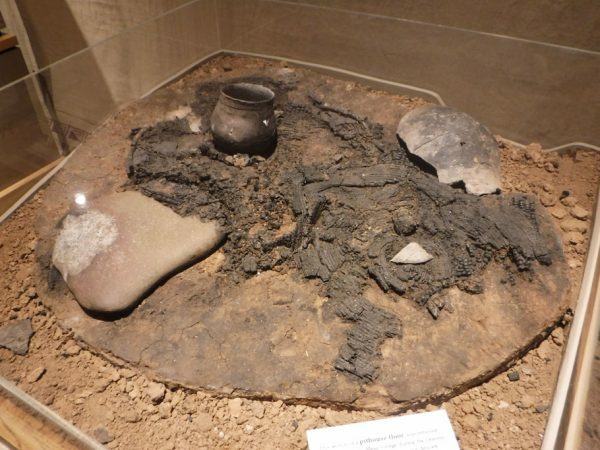 Together, the Twin Towers contained 16 rooms. This view is from the back. Side view of the Twin Towers. View looking past the Unit House. 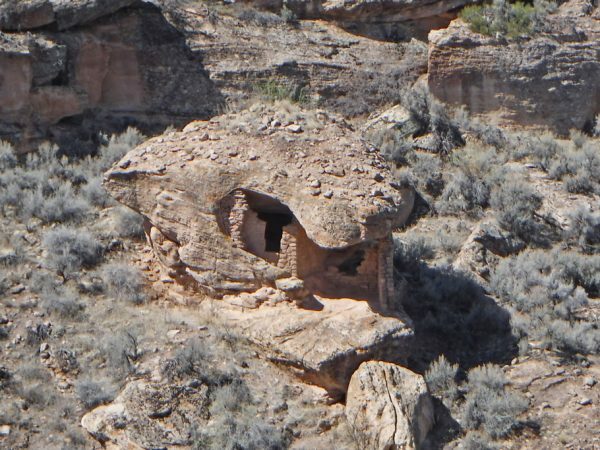 Down in the canyon, the eroded boulder structure looks a bit like an eagle’s head staring at us. Farther back on the rim are the Twin Towers. 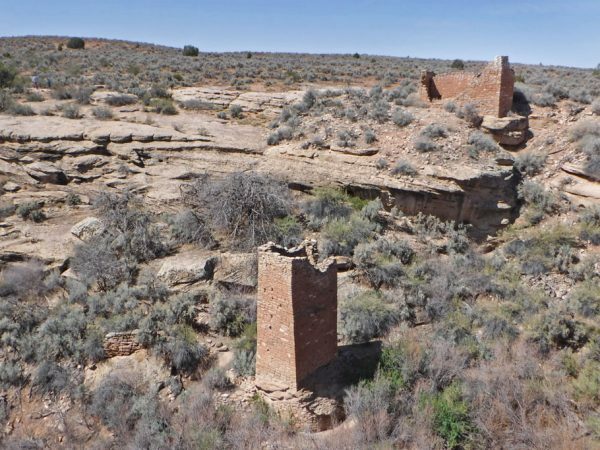 You can see how the towers are built on two matching outcrops, with their walls extending to the very edges. And in the center on the far rim is Rim Rock House, which was probably a two-story storage building. Another view of Unit House. It is estimated that two acres of the surrounding farmland would be required to support a person for a year. This canyon must have been pretty lively place during planting and harvest time. 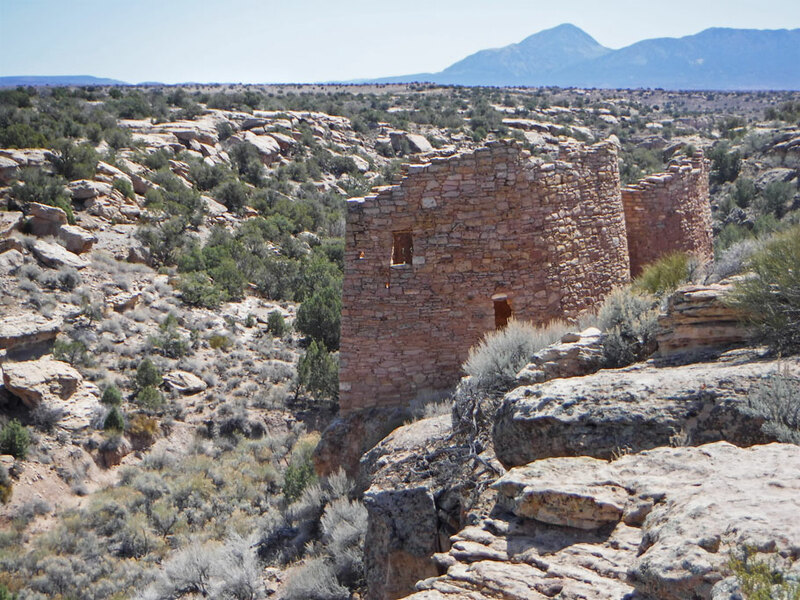 The Hovenweep National Monument is made up of several sites. We left the visitor center, drove down some paved road through private land, drove down some questionable unpaved road, then hiked here. This was our “hundering” pattern for a couple of days. 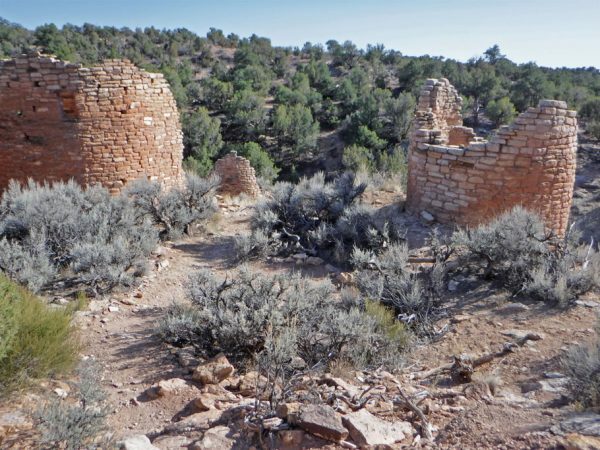 We are at the Hackberry site. Tower at cliff’s edge in Hackberry. The Acoma word for tower is “ooka-zaa-nee”. It means “where the town crier speaks from”. Easy to visualize here. 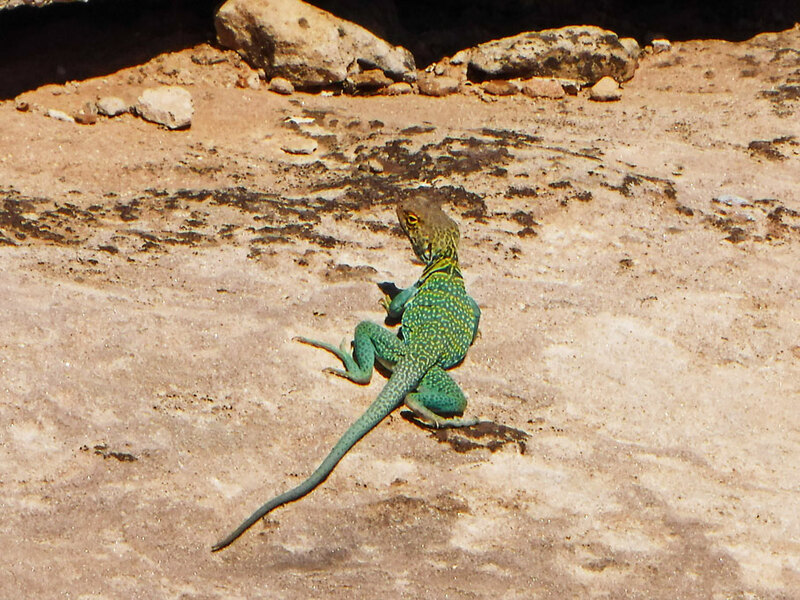 Collared Lizard poses for Duwan at Hackberry. 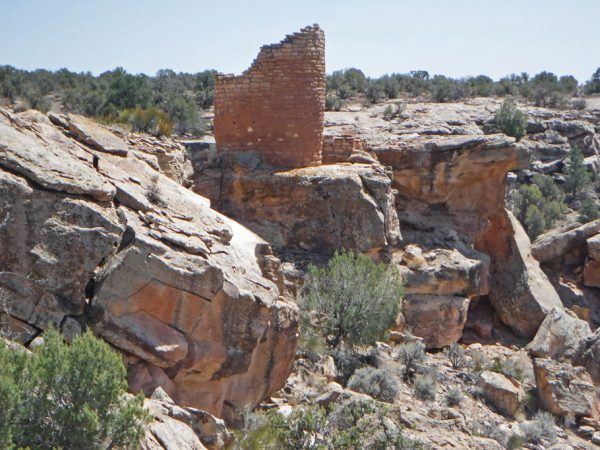 Now we’ve hiked on to the Holly site where we see my favorite tower, built atop a boulder. Oh look, part of the rock juts out a few inches. Better make another corner to capitalize on that extra surface area at the base. Up to now Dylan’s bare bones acoustic “Watchtower” has been playing in my head. It just got bumped out by Jimi’s version. Structures at Holly site. The wooden beam in the building on the right is original, dating back to late 1200’s. “Hey. Hold my peyote buttons and watch this.” This is just one more example of a break from the orderly, well planned Chaco Culture. The Chacoan peoples built strait roads that ran up cliffs and over mountains. Their descendants cared nothing about walking in straight lines. If Chaco was the Beatles, these guys were the Ramones. The edifice on the left shows that you can build a little too close to the edge. 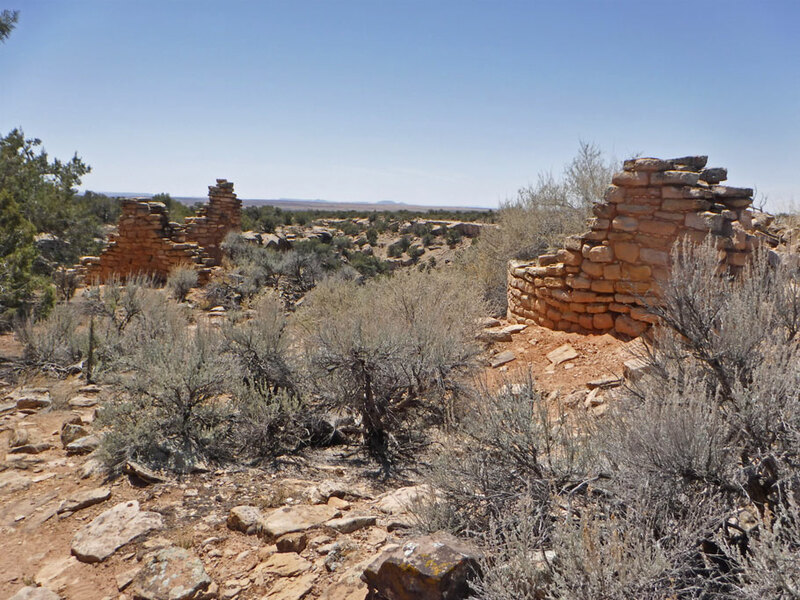 We’ve hundered up the road to Painted Hand pueblo. In the top left under this overhang you can barely see where blue paint has been sprayed (probably by mouth) around someone’s hand. There are fainter prints as you look right. And a very faint large print at bottom center. Did you ever trace your hand or press it into ceramic as a kid? Tower built on a rock at Painted Hand. Space under the rock was also used. 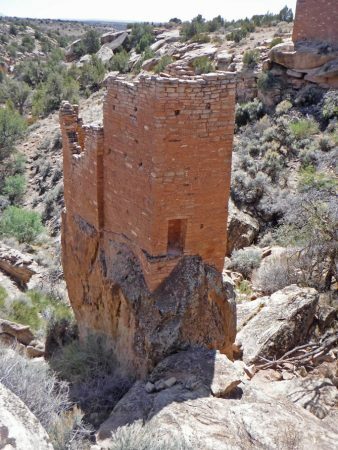 We’ve parked for the night and hiked out to Cutthroat Castle. This community was not really near a spring. It did have the usual check dams to hold rain water, though. 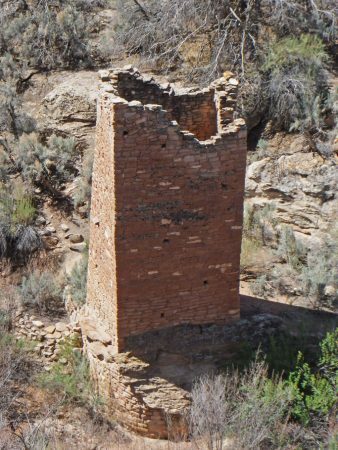 Double-walled circular structure at Cutthroat Castle. 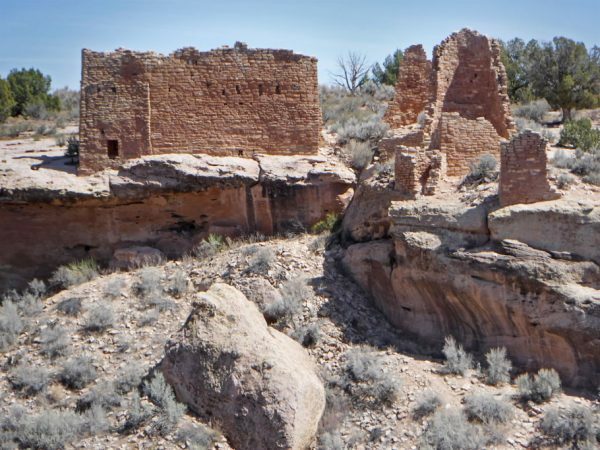 There is some debate over whether there was a defensive purpose for some of the buildings. Were the inhabitants protecting themselves from northern raiding parties? 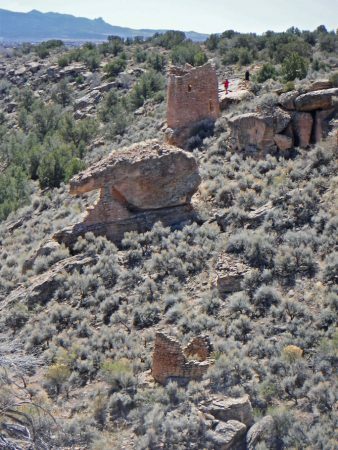 More of Cutthroat Castle site. 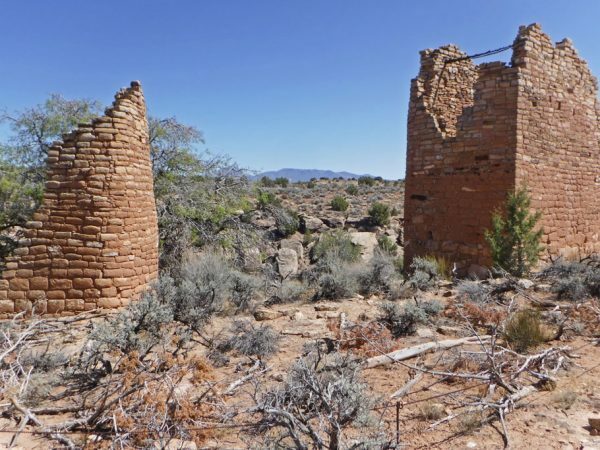 The folks who lived here grew crops, ground corn, wove baskets, fired pots, built multi-story structures using masonry, and constructed solar calendars. Did everyone have these skills, or were there specialists? If there were specialists, did they travel among the different villages sharing their skills? 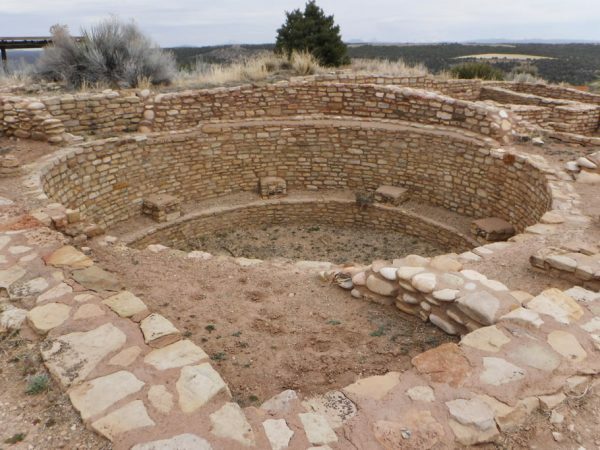 Here is a large external kiva at Lowry. (It’s really circular.) 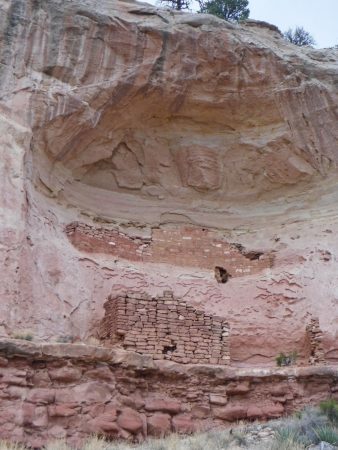 We have seen brick bases for the roof pillars before, but these are shaped as pueblo winter and summer figures. At Lowry we learned that kivas were not just ceremonial, but were important living spaces as well. 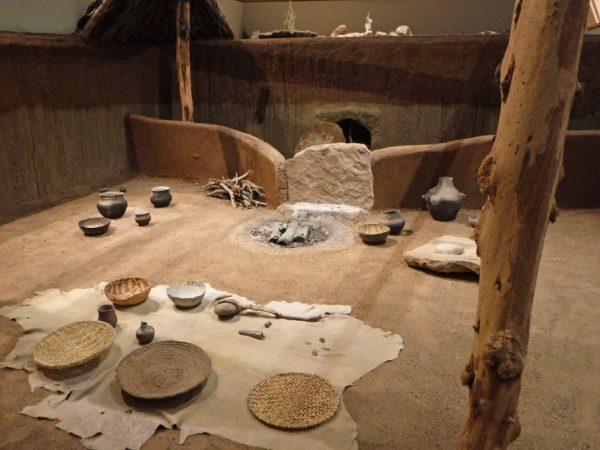 From Lowry we drove to the Anasazi Heritage Museum. 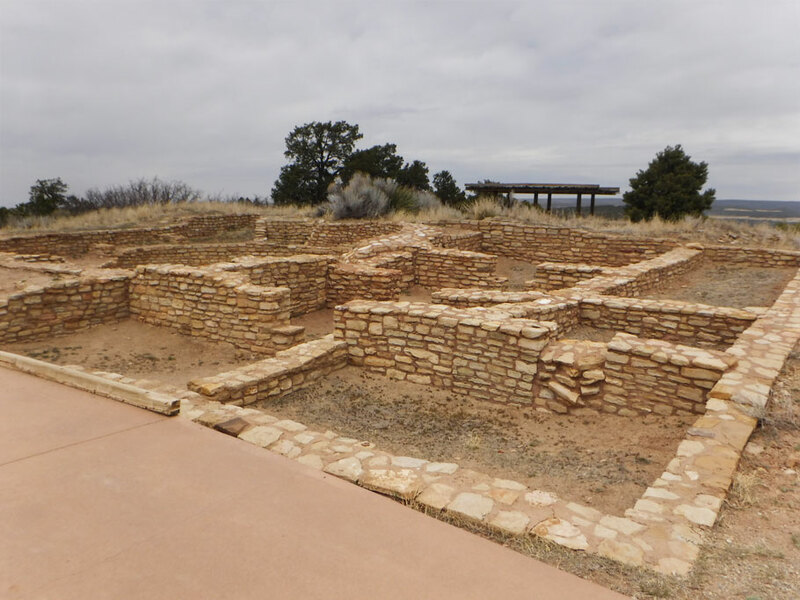 This excavated Escalante pueblo is behind the museum. 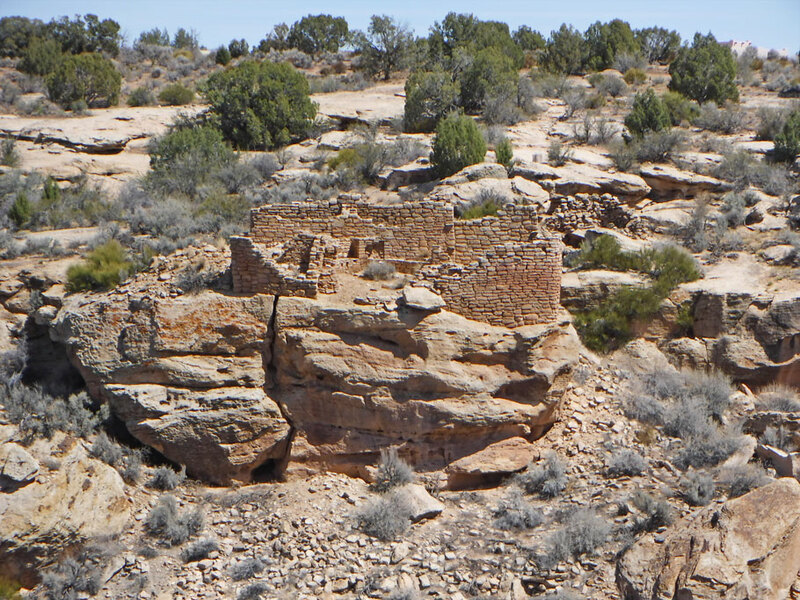 More of the Escalante pueblo. 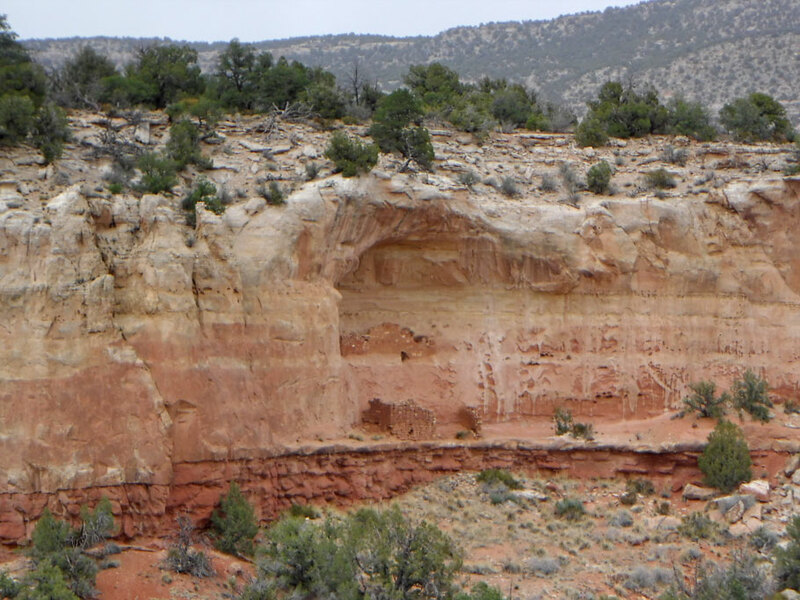 Our last hunder started at the south end of Sand Canyon. 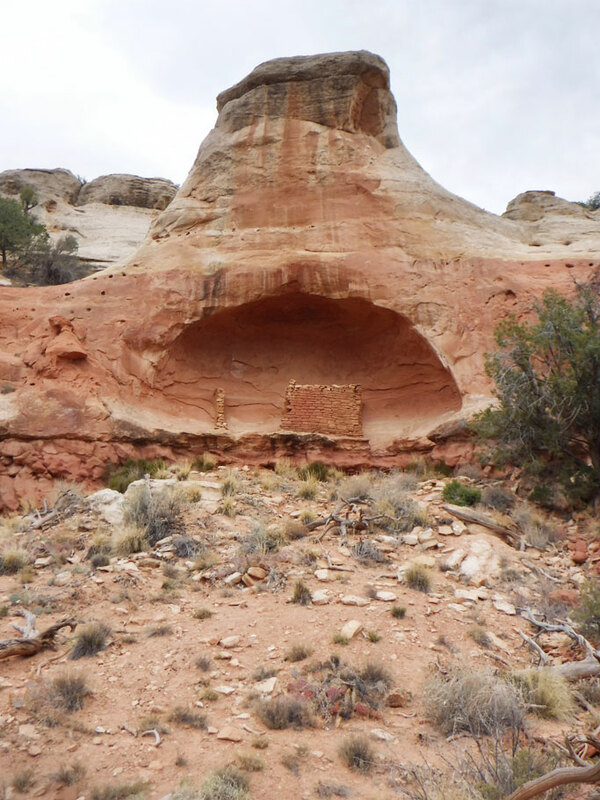 We hiked a nice long trail, seeing some dwellings. Here is a frontal view of Saddlehorn Pueblo in Sand Canyon. Under this overhang is Corncob house. Look closely to see the three buildings. 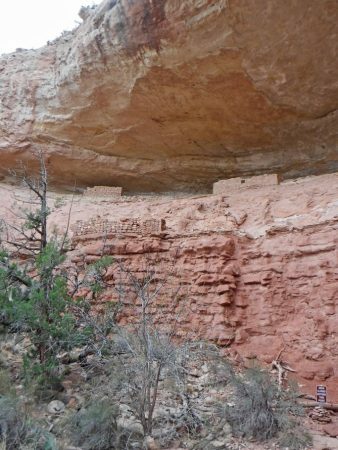 Here is another view of Double Cliff House. You can see both levels. 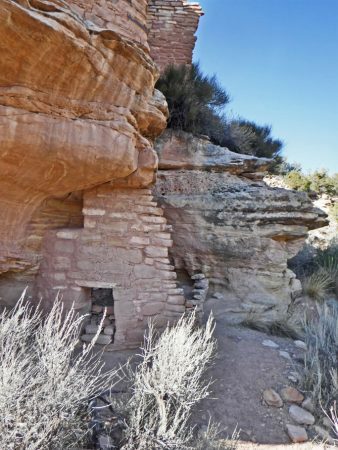 There is a concentration of pueblo buildings further up the trail, but it’s time for us to turn around. 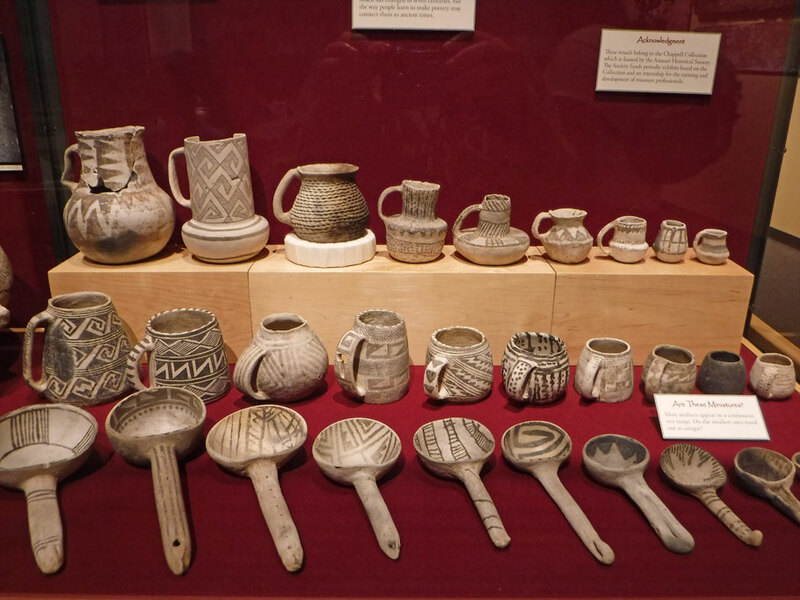 A set of artifacts at the Anasazi Heritage Museum in the Canyon of the Ancients. 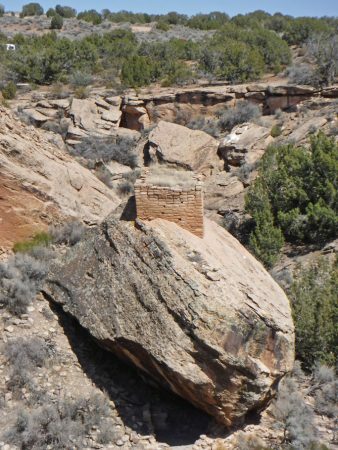 This section of rock floor was lifted up as-is. This pueblo caught fire, and the burned surfaces preserved these relics. There are two baskets, a pot, some potshards, and ears and kernels of corn. Reconstruction of a pueblo interior with baskets, pots, and fireplace. Behind the column is a metate used for grinding corn. This entry was posted in Colorado, Travel On The Dirt, Utah and tagged Anasazi Heritage Museum, Canyon of the Ancients, Colorado, Hovenweep, hundering, museum, National Monument, Native American Ruins, Native Americans, NPS, Ruins, Utah. Bookmark the permalink. Wow…them’s a lot of rocks! 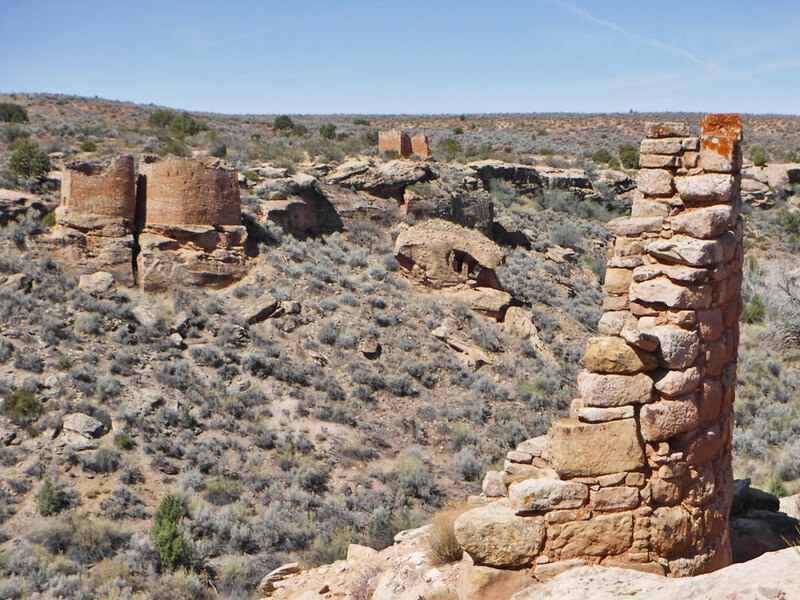 Seriously though, those ruins are pretty darn cool! We’re talking about someday getting a land yacht to do some exploring, and I’ll have to remember to come back to your blog for suggestions once that time comes! Hope to see you in Indiantown! Hope I get a chance to see you and Jim too! Safe travels across the Gulf Stream! There is such so much stuff to see in the world and especially in the Western US. We are really enjoying our Land Yacht! I can’t thank you both enough….I’ve learned more about US and Mexico from reading and SEEING your blogs….it’s simply amazing and you explain things so clearly. We may envy your travels, but we really appreciate your sharing so much with us “home bodies”. Keep going and keep posting blogs. I’m sure there are many like us that rarely comment, but we look forward to each and every post! Miss you guys! Thank you for following along! We love comments, but it is enough knowing that people keep clicking on the links and reading the posts. Miss you guys too! I think you need to get “hundering” t-shirts made up for the two of you to wear. Maybe even a tiny one for Bob too. Might help protect him from sunburn sitting on the dashboard like that. What Bob wants is a cowboy hat. He doesn’t get sunburned, but his fur is a little dry and peely – he could probably use some moisturizer. bien hecho! The stonework, I bet they had freemasons, just like Europe and Asia. Thanks! I’m sure they were very organized and efficient. 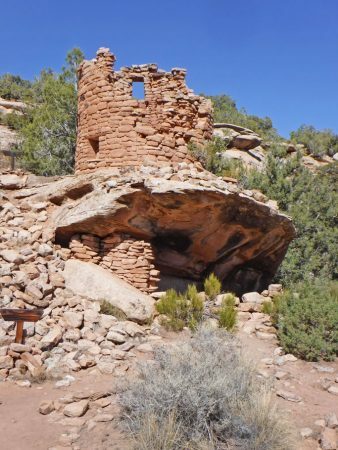 Otherwise, I can’t imagine how you would build a tower on the side of a precariously balanced rock.